A postulate of human progress is surely that the freedom to drink alcohol has brought much of our great advance. Indeed, with the current craft cocktail revolution came the resurgence of classic cocktails across the nation and beyond. One little-known country that contributed so much to that great advance was Malaysia. Whether we owe it to Jeff “Beachbum” Berry for discovering it, or New York bartender Giuseppe Gonzalez, for popularizing it, America’s growing love for the Jungle Bird cocktail is more popular than ever today. For the past three years, it has been the best-selling cocktail in the U.S. and tops many ‘best of’ lists. Made of rum, sugar, lime juice, pineapple juice, and Campari, the Jungle Bird’s rise in popularity can be attributed to a few factors. One is the inclusion of Campari, which has enjoyed a renaissance of sorts as Americans discover classic drinks, including “sibling” beverages like the Rum Old Fashioned and the Sazerac. In fact, there’s been a 58 percent increase in the number of 25-44-year olds drinking Campari in the last four years. The other is dark rum, which cocktail archeologist Jeff “Beachbum” Berry specifically interpreted as ‘dark Jamaican rum’ in his seminal 2002 book Intoxica! While any generic style of dark aged rum may have been used in the original cocktail, the most likely culprit would have been the classic molasses and caramel-laded Myers’s Original Dark, which would have been a logical choice in the 1970s. Taking it a step further, New York bartender Giuseppe Gonzalez, attracted further attention to the drink in 2010 by substituting dark Jamaican rum for the very specific and intense Cruzan Black Strap Rum. He also reduced the amount of pineapple juice (4 oz down to 1.5 oz) to create that perfect balance of sweet and sour flavor. The New York Times even picked up on the drink in this 2014 article, which really catapulted the drink into superstardom. 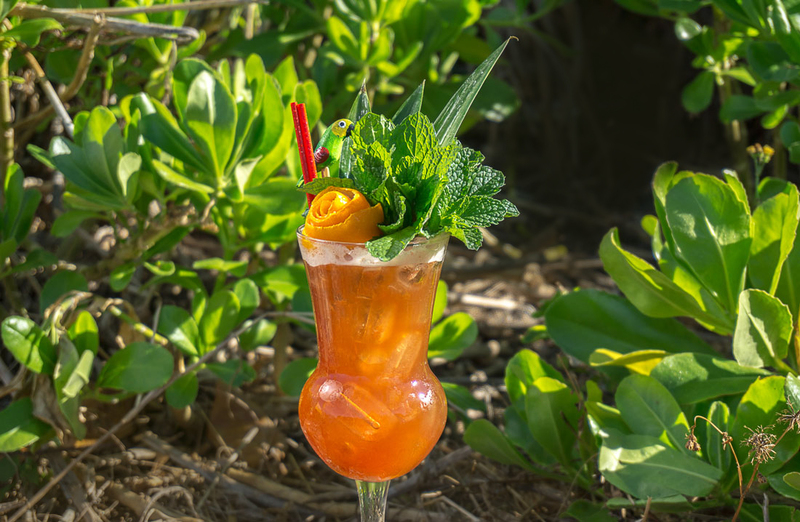 Drunken Tiki’s Jungle Bird cocktail back in February 2017, as reformulated by Giuseppe Gonzalez, utilizing Cruzan Black Strap Rum and reduced pineapple juice for a more tightly balanced profile. 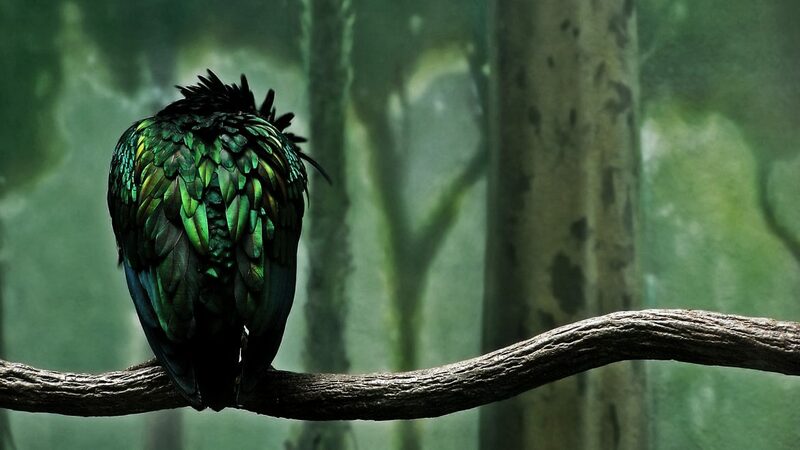 The Jungle Bird’s adaptability has also helped it climb the ranks in the spirits market, where today’s bitter-loving cocktail crowd have embraced it exponentially. Indeed, while it has become a popular Tiki cocktail in virtually every bar that embraces the romanticized concept of tropical cultures, it’s a great tasting drink that takes about five minutes to make and requires an elaborate bird-like garnish. While other cocktails such as the Rum Old Fashioned, Sazerac, and Negroni are seen as typical speakeasy-era drinks, the Jungle Bird is more of a head-on collision of classic and cutting-edge. It is also easy to make at home and only requires five ingredients that can be bought in most neighborhood grocery stores. Kara Newman of PUNCH ran an excellent article in 2016 that fleshed out the cocktail’s meteoric rise to fame in more detail. The original 1973 KL Hilton logo displaying Szechuan and Hunan-themed fonts that were popular at the time. In 1973, a German national named Reinhard Steffen, who was the Food & Beverage Director at the KL Hilton at the time, had concocted the aptly-named ‘Jungle Bird’ cocktail as the hotel’s official welcome drink. Originally, the concoction was served in a ceramic bird-shaped vessel which emphasized tropical fruity flavors and had an unusual bright red color. Journalist Kim Choong of Thirst Mag has the fascinating full story here. Officially launched on July 6, 1973, the former KL Hilton, which was initially located in Jalan Sultan Ismail, was the first five-star hotel to be opened in Kuala Lumpur. An earlier description of the hotel’s Aviary Bar, described how guests would see live birds through a glass panel, where they were kept in a netting area near the swimming pool. Others may prefer something more Malaysian: in the Aviary Bar you may have your drink amidst lush tropical foliage and an aviary of exotic jungle birds. Live entertainment is furnished by a jazz quartet, a trio, or a solo singer. Originally intended as a welcome drink for guests, the fabulous cocktail had been on the hotel’s original menu since 1975. Sadly, the KL Hilton was demolished in 2013, however, the new KL Hilton (located on Jalan Stesen Sentral) serves the famous cocktail at its Chambers Bar located inside the hotel lobby lounge. Interestingly, they forgo dark rum altogether in favor of a light Cuban rum, Havana Club Anejo 3-year. 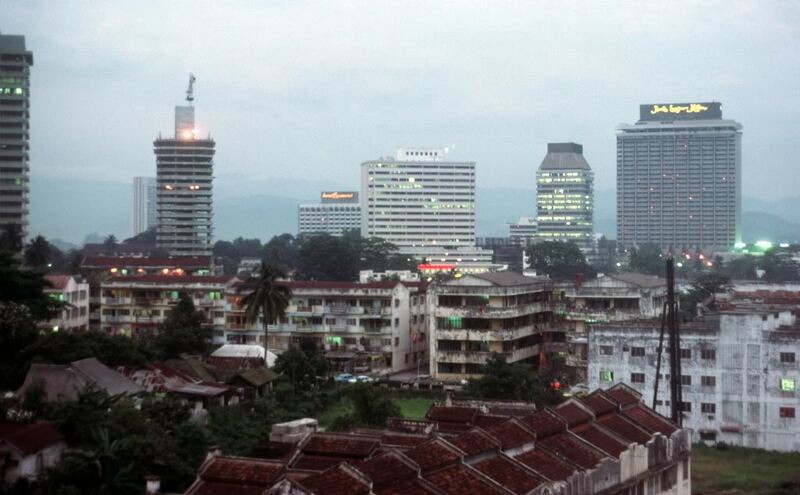 The former KL Hilton pictured in 1978 (far right) looking east towards Jalan Raja Chulan and Jalan Sultan Ismail. It is important to note that while some food trends stayed strong into the 1970s, like fondue, and Jell-O, there was more of an emphasis on fresh vegetables and fruit, which corresponds to the Jungle Bird’s original pineapple/cherry garnish. In fact, anything with pineapple was fair game in the 70s due to an increased interest in Hawaiian culture. The Kuala Lumpur Hilton was KL’s first high-rise luxury hotel and still maintains its world-class standards for service and quality. The lobby’s fresh flowers and glowing chandeliers set a tone of crisp elegance. Conveniently located in the Golden Triangle, the hotel offers bird’s-eye vistas of the city from its 36th floor Paddock Room. The pastel-decorated rooms have a bay window and sitting area, plus a desk. The Aviary Bar, just off the lobby, is a popular meeting lounge, and the Melaka Grill features gourmet dining. The hotel’s cosmopolitan reputation is enhanced by an English pub and Chinese, Japanese, and Korean restaurants. What is even more interesting is the drink’s duality – that is, as both a craft and Tiki cocktail. As one cocktail sleuth believes, the Jungle Bird should be considered a ‘gateway’ drink and that the people who consume it will be more likely to want to try more Tiki-forward cocktails in the future. “I checked out a lot of the new, super high-end craft cocktail bars that were not Tiki, and they all had Tiki drinks on them! Like, there’s one drink called the Jungle Bird, which you can get at every craft cocktail bar now—craft cocktail bartenders love it because there is Campari in it. That’s their gateway to Tiki drinks, but you can go to a non-Tiki craft cocktail bar in Berlin, London, Dubai, Tokyo, New York, San Francisco, and you will find Tiki drinks on the menu now. Almost all of them do the original Trader Vic Mai Tai, the Jungle Bird, most of them will do a Zombie. They’re all starting to embrace it,” Jeff “Beachbum Berry, stated in a 2014 article. 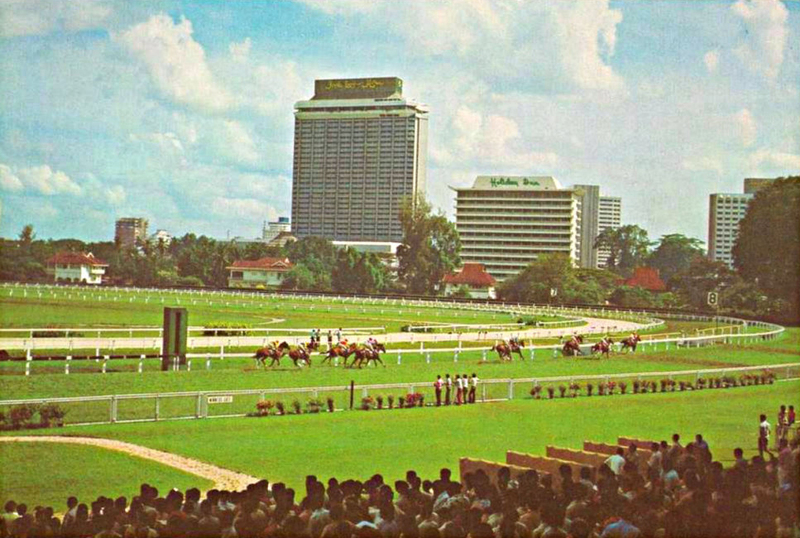 An early 1970s postcard depicting the KL Hilton from the west side overlooking the old Jalan Ampang race course. While Berry theorized the use of a dark Jamaican rum, and Gonzalez’s use of Cruzan’s Black Strap Rum added a healthy dose of licorice and molasses, the balance of the pineapple juice and the Campari proved to be the whole trick of the drink. However, even with Gonzalez’s proportions, the Jungle Bird was still longing for something else. Raising the bar even further and elevating the Jungle Bird firmly out of its comfort zone, Lemon Hart & Son Rum has come up with the definitive version of the quintessential Malaysian cocktail yet – the “Black Bird.” For the iconic cocktail, it only seems fitting that it should be paired with an equally iconic brand. 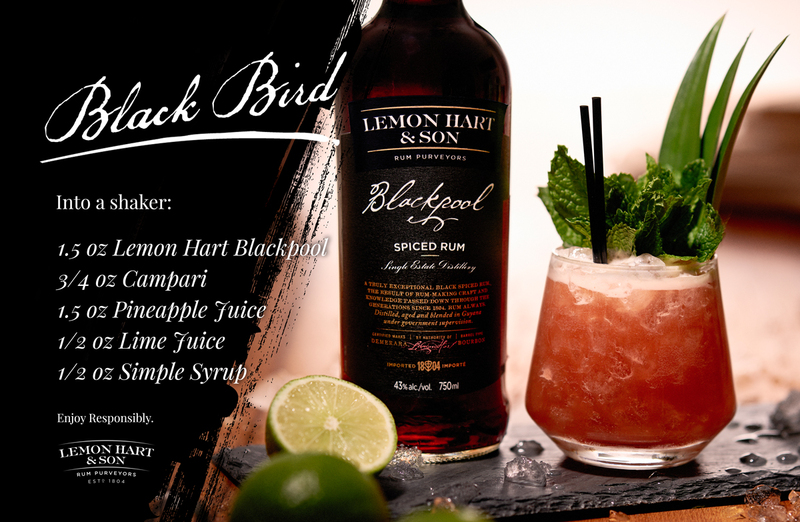 In terms of adding sheer flavor and complexity to the cocktail, the addition of Lemon Hart Blackpool Spiced Rum (at 43%) was the missing link in the Jungle Bird’s epic flight. The mix of velvety texture, sweetness, fruit, and spicy bitter in your mouth will captivate you and keep you coming back for more. Whatever species the real Jungle Bird that inspired Steffen’s cocktail may have been, one thing is for sure, the cocktail’s exalted place in the barroom pantheon was not easily won and still today, with the addition of Lemon Hart & Son’s new Blackpool Spiced Rum, the Jungle Bird is enjoying its epic flight. Lemon Hart & Son Blackpool Spiced Rum is now widely available in the U.S. and Canada and costs $27.99 for 750ml bottle.